« Kristi Hawkes, Max Boyle, Lou Laurence Live at the Wise! It’s the 6th annual winter solstice party for stereo-viola folk rockers, Salt Thief(FKA No Mothers). Sharing the party stage for the second consecutive winter solstice is Vancouver’s legendary purveyor of good-time rock-out dancing, High Society! 5 years ago, on the winter solstice of 2012, two viola-wielding brothers named John and Tony shredded a dueling fiddle set in front of a living room of friends. Salt Thief was born and the winter solstice party has become a legendary tradition. This show marks 5 years of stereo-viola folk rock, and the boys, backed by their spectacular band, have never been more on top of their game. This particular show also marks a couple of firsts: the first solstice party under the new name Salt Thief, and the first not in a packed living room but in the friendly and well-equipped Wise Lounge. Come burn up the long night with us! 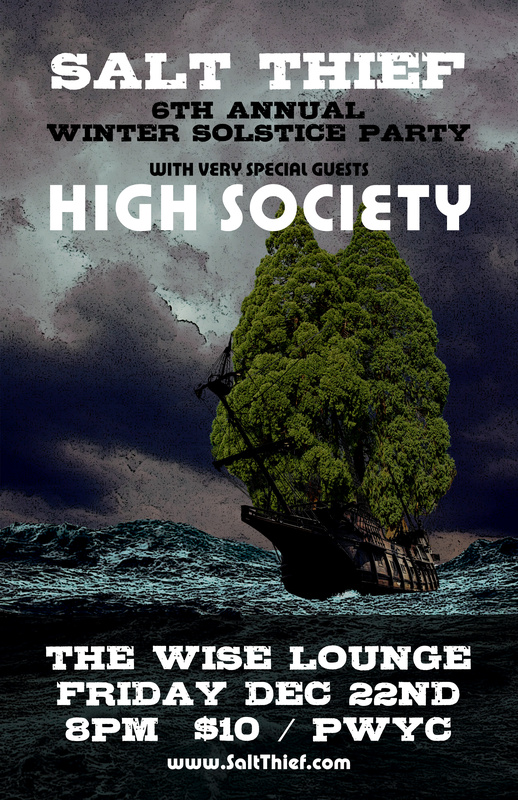 High Society is an unstoppable and dramatic Rockin’ Soul and Blues band, eager to fill your eyes and ears with euphoric excitement and inspiration. Based out of Vancouver, B.C. the band’s unique and contemporary take on old school performance has been heard in theaters, pubs, cafés, street corners and on the radio across the country. Their relentless hard work has built them a reputation as an unforgettable band that blends R&B, Soul, Blues, Folk, Hip Hop, and Jazz. High Society is fronted by the incendiary Adam Farnsworth on keys/vocals alongside the beautiful and inimitable Chelsea D.E. Johnson on guitar/vocals. Their solid rhythmic foundation is held down by Ashton Sweet on baritone saxophone, Dave Taylor on electric bass and Kenan Sungur on drums and vocals.